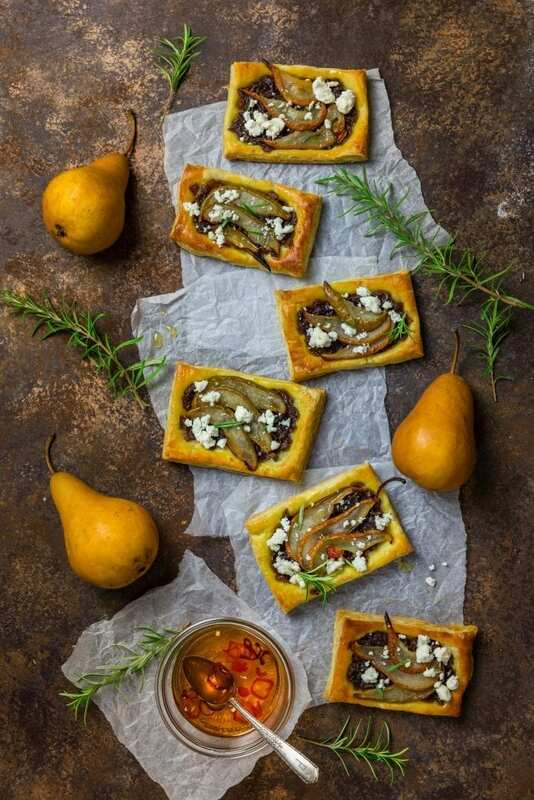 These are what you want for a holiday party: buttery puff pastry tartlets topped with oven-roasted pears, balsamic-caramelized red onions and goat cheese crumbles. A drizzle of spicy chili-honey puts it over the top. 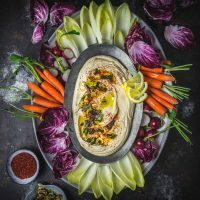 While we love throwing parties around the holidays, we inevitably get so busy that what we envisioned as a relaxed morning of prepping nibbles ends up being a scramble to get food on the table before our famished guests start experimentally sprinkling salt and pepper on the cats. That’s when a time-saver like puff pastry sheets becomes our best friend in the kitchen. In fact, the day before a party, we often defrost a box just on the off chance that we’ll need to make more vittles. 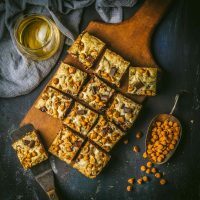 It’s a matter of minutes to throw a few ingredients onto a pastry square and bake it. 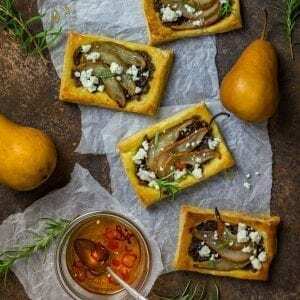 We recently found a combination that requires a little more prep time, but is so worth it: roasted pears, caramelized red onions, goat cheese and chili-infused honey. 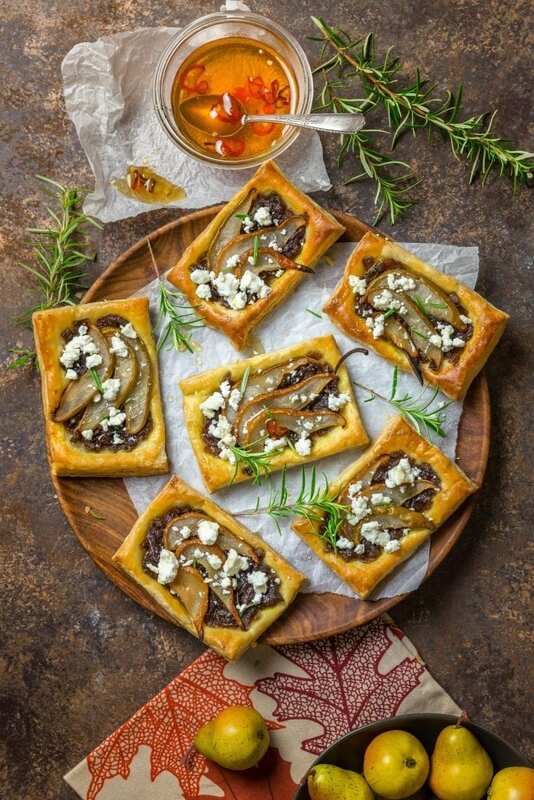 It’s so satisfying that these tarts, maybe with a simple cheese board, are all you need to wow and satisfy your guests. The toppings can be made in advance and even assembled the day before, so all you need to do the day of the party is pop them in the oven. Easy peasy. Also, don’t forget to check out our tips for buying and cooking pears below. The variety you buy matters! We used Bosc pears (shown here), which keep their shape when cooked. The great thing is that several of the elements can be made days, even weeks in advance. 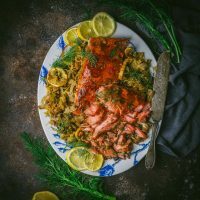 The caramelized onions can be made a day or two ahead, the pears can be roasted the hours or even the day before, and the chili honey will last for weeks in the refrigerator. 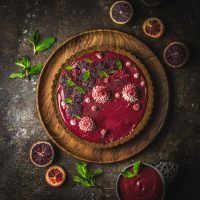 You can even assemble the tarts, cover them with plastic wrap, and refrigerate them overnight. Then when you’re ready, brush the edges with egg and bake them off. We like to crumble the cheese (we used goat but blue would also be fantastic) over the hots tarts as soon as they’re out of the oven rather than bake them with the cheese on. This keeps the goat cheese from drying out (and if you use blue, it will keep it from melting into a puddle). Scoring a rim and poking the middle of the puff pastry gives these a clean look. A drizzle of spicy honey gives these an unexpected kick. Once the tarts are cooked, drizzle them with spicy honey. If you have honey leftover, it’s fantastic on cheese, brushed onto pizza crust, drizzled over fruit. One thing you may have noticed about pears, they are impossible to catch at perfect ripeness. They’ll be rock hard for weeks and then, boom, mush. Eddie Izzard knows what we’re talking about (warning, bad words, but said in a British accent so really quite charming). Our ultimate Nerds with Knives guide to buying and cooking with pears. What variety of pears you choose matters! Some are great for eating, others for baking. Some hold their shape when cooked, others fall apart. Knowing which variety will suit your recipe is important (unless honey pear, don’t care). Comice pears are our favorite, hands down. Very smooth flesh, with a sweet pear flavor. Bartletts are our second favorite. They tend to be extremely juicy and sweet. Starkrimson have a similar flavor to Bartletts, plus a gorgeous red color. Bosc pears are quite tasty raw with a crisp, delicate flavor. Asian pears are very crunchy and mild. These are great in salads and slaws. Bosc pears are best at keeping their shape, even when fully cooked so they’re our top choice for poaching, sliced in tarts and pies, anything that needs to have a pear-shaped fruit. Anjou pears hold their shape well, though they get softer than Bosc. French butter pears are small, pretty pears related to Anjou, and hold their shape similarly. Bartlett pears have incredible flavor and will practically melt into pear purée with the slightest encouragement. Perfect for making pear butter. Comice also break down quite easily and have great flavor. Seckel pears. Those little beauties are practically made for homey Fall place settings, and should probably stay there. They can be eaten but have to be very ripe or it’s like biting into a hard lemon. In a small saucepan set over medium heat, bring honey to a bare simmer. Add chili and reduce heat to low and let cook 15 minutes. Turn off heat, and let sit 30 minutes. Transfer to a small jar, straining if desired. Spicy honey can be made up to 2 weeks in advance. Position rack in the upper third and 1 rack in the lower third of an oven and preheat to 400°F (200°C). Line 2 baking sheets with parchment paper. Melt 1 tablespoon butter in a small bowl. Core and slice pears, length-wise, into ¼ inch thick slices (you should get about 12 slices per pear, depending on size). Lay pears slices onto a baking sheet in a single layer. Lightly brush one side of the pears with butter and sprinkle lightly with sugar (about ½ teaspoon sugar per side), turn slices and brush and sprinkle the other side. Roast pears until soft and lightly caramelized, about 20 minutes, flipping pears half way through. Remove pears to a plate and lay on a new sheet of parchment, if needed. Meanwhile, heat oil and 1 tablespoon butter in a large skillet set over medium heat. Add the onions and 1 teaspoon salt and cook, stirring occasionally, until the onions are soft and light brown, about 15 minutes. Stir in balsamic vinegar, ¼ teaspoon pepper and rosemary and cook until vinegar turns syrupy, about 10 minutes. Turn off heat and set aside. Lay puff pastry sheets on a cutting surface and cut into 5-inch long, 3 inch wide rectangles. With a sharp knife, score a rim about a ½ inch in from the edge, making sure not to cut through, and poke inside the rim with a fork. Place pastry on the prepared baking sheets, spacing the pastry about 1 inch apart. Place a heaping tablespoon onions in the center of each rectangle. Add 2 or 3 slices of pear. Brush edges of the pastry with the egg mixture. Bake, rotating the baking sheets from top to bottom and front to back halfway through baking, until the pastry is crisp underneath and golden brown on top, about 25 minutes. Crumble a tablespoon or so of goat cheese over tarts and transfer to a platter. Drizzle each tart with a little spicy honey. Serve warm. **Note: Spiciness of chilis vary widely, even from a single variety. We recommend adding half the chili, tasting and adding more as desired. It will get a little hotter as it sits, if you don’t strain it. I can’t say enough about how delicious these are. I woke up at 3 AM, trying to find a recipe for onion tartlets; these were vastly different than what I was seeking, but I decided to give them a try. First, they’re pretty easy to make. And asI will be making a couple of batches of caramelized onions to freeze until I need them for holiday parties, it’ll cut down on last-minute prep work. Second, they are just profoundly delicious. There is such a complexity of flavors … savory, tangy, sweet, and buttery. I took them to a Hannukah party last night, and they were gone in an instant. I’ll be making them again, at least once more, by the time the holidays are over! Hi Beth – I’m so happy you liked them! Freezing the onions is a really good idea and saves a lot of time. Hope you have many more fun parties!